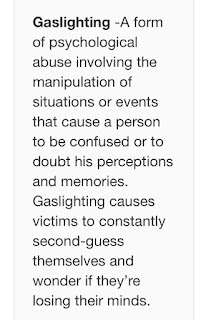 I understand that this group normally focuses on personality disorders on an individual basis but I was wondering if you could explain to me if gaslighting ever happens in other situations. 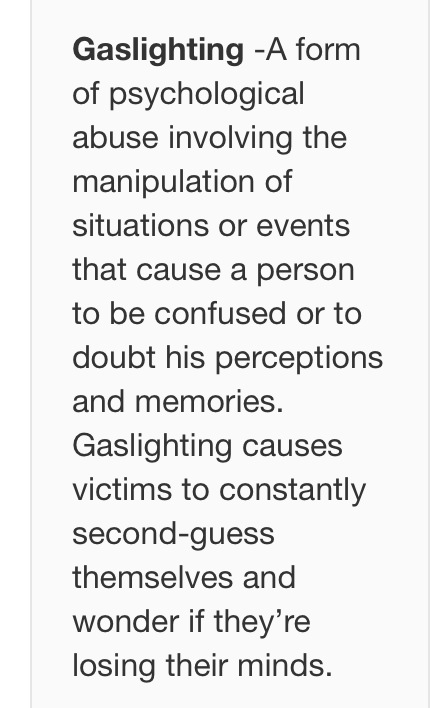 Can a person experience gaslighting in places other than in their own homes and personal relationships? You have asked a great question and the answer is a capital YES!! It is important to know the red flags of abuse so that you can use your critical thinking skills in other areas of life as well. One such example of gaslighting on a grand scale can be observed on a daily basis when the public is informed about what is good for them and then new prescriptions or healthcare treatments are suggested. Sometimes the treatments are created as a prevention to disease but in reality the treatments are either not effective or they cause injury. When an injured party questions the treatment they are then led to believe they are crazy by their doctors and the government or labeled a conspiracy theorist in order to thwart further questioning. This practice actually leaves a major portion of the population scratching their own heads wondering if they are crazy for doubting people in such noble professions as healthcare and government. Love Triangle: Not-for-Profits, For- Profits, and Government. Corruption in the American government is becoming painfully obvious when researching Not-for-profit and For-Profit organizations and the roles these institutions play in policy making. In recent years, the unethical practices that have merged as the result of large corporations investing in Not-For-Profit organizations which play key roles in that result in public policy is unethical and should be banned from practice. The results of these unethical practices can be felt not only in the United States but worldwide. The relationship between a government agency, a foundation, and a pharmaceutical company has led to a crisis in the global healthcare system which is resulting in the harm of citizens around the world. When it comes to something as important as a person’s body and health an extreme amount of caution should be taken in order to avoid corruption in this configuration. As most people who watch television are aware, there is a growing epidemic of bad drugs being passed off onto the American public. While there are agencies and laws that are put into place to ensure the safety of pharmaceuticals these policies are being circumvented because of the relationship that has been established between pharmaceutical companies, the foundations that produce the results of research, and the governmental agencies put into place to ensure the safety of products made available to the public. The public relies on the government to ensure its safety and best interest. However, the public’s best interest is being jeopardized due to greed and corruption. A closer look needs to be taken into the love triangle which has merged between the CDC, The CDC Foundation, and the pharmaceutical company known as MERCK in the United States but MRK in other countries. The CDC Foundation was created as an extension of the CDC in order to get private funding for research as a means to improve public health. The problem occurs when a company such as Merck donates private funding towards The CDC Foundation in order to have its product passed for safety and put on the market to the general public. This relationship, in itself, creates a conflict of interest and should be banned from practice. The relationship established between the CDC, The CDC foundation, and Merck pharmaceuticals is not in the best interest of the American public because it is putting lives in jeopardy for a profit. “…to protect America from health, safety and security threats, both foreign and in the U.S. Whether diseases start at home or abroad, are chronic or acute, curable or preventable, human error or deliberate attack, CDC fights disease and supports communities and citizens to do the same.” (Mission, Role and Pledge 2014). The CDC was put into place to conduct research that would make American citizens healthier, safer, and provide inexpensive treatments to the general population and funding to obtain this goal is generated by the American taxpayer who entrusts this agency to act in its best interest. Moreover, the “CDC conducts critical science and provides health information that protects our nation against expensive and dangerous health threats, and responds when these arise.” (Mission, Role and Pledge 2014). According to the mission statement the goal of this agency is to protect Americans from disease, conduct research, and establish treatment for disease. The research gained from studies and experiments is then analyzed and implemented into practice by creating laws and policy. The CDC’s role is to spread awareness of disease while simultaneously eradicating them. One role that needs to be examined further here is the accuracy and honesty of the statement that the CDC is “Tackling the biggest health problems causing death and disability for Americans.” (Mission, Role and Pledge 2014). After examining the relationship established between the business triangle that was created by the CDC, The CDC Foundation, and Merck pharmaceuticals it becomes painfully obvious that the American people have been duped out of Billions of tax dollars and their health. The pledge made by this agency to “Be a diligent steward of the funds entrusted to our agency, Provide an environment for intellectual and personal growth and integrity, Base all public health decisions on the highest quality scientific data that is derived openly and objectively, Place the benefits to society above the benefits to our institution, Treat all persons with dignity, honesty, and respect” (Mission, Role and Pledge 2014). It can be found after examining the connections between this agency and the Not-for-Profit and For-Profit organizations that the above statements are untrue. This agency has placed the American public and society at risk because their public health decisions are based on scientific data that is not derived openly or objectively because the research this agency relies on is being gathered from a Not-for-profit that is funded by an organization with a special interest in the outcome of the research that is conducted. The CDC Foundation was “Established by Congress as an independent, nonprofit organization, the CDC Foundation connects the Centers for Disease Control and Prevention (CDC) with private-sector organizations and individuals to build public health programs that make our world healthier and safer.” (CDC Foundation 2015). This foundation was founded in 1995 as a means to gain funding for medical research. According to the foundation website “the CDC Foundation has provided $450 million to support CDC's work” (CDC Foundation 2015). The intention of this established nonprofit organization seems rather altruistic until one takes a closer look at the research provided by the foundation that has been faulty and led to injury and/or death. On any given day the public can see the outcome of this faulty research in a single hour of watching television. Every other commercial seems to be either about a new drug with a slew of bad side effects or an advertisement for a personal injury lawyer who is bringing a class action lawsuit against a pharmaceutical company for a bad drug. This contradicts the mission statement of both the CDC and the CDC foundation. With the use of bad drugs the American public and the world are not safer or healthier. In fact, the opposite is true and this is due to a special interest taking part in the outcome of medical research in order to gain a profit. “Established by Congress, the CDC Foundation helps the Centers for Disease Control and Prevention do more, faster, by forging effective partnerships between CDC and corporations, foundations, organizations and individuals to fight threats to health and safety. The CDC Foundation is a 501(c)(3) public charity.” (CDC Foundation 2015). This is an absurdly unethical relationship and there are laws in place to prevent the mingling of government agencies with corporations for a very good reason. When corporations influence government agencies it results in corruption and unethical business practices. “By every measure our nation is dramatically better prepared for public health threats than we were a decade ago. However, ongoing reductions in public health preparedness and response investments are impacting the national public health infrastructure that prepares for and responds to routine public health threats in addition to terrorist threats, novel infectious diseases, natural disasters, and biological, chemical and nuclear emergencies. Even though funding cuts have been made, CDC still has the responsibility to get the job done and protect the American people from public health threats.” (Frantz 2015). It seems that this foundation has not yet seen a crisis because of the ignorance among American and global citizens to implement all of the suggestions made by the research generated with the billions of dollars in funding. It is becoming apparent that the main goal of the human race is obviously to achieve immortality with all of this disease prevention and eradication. Its good business practice to be in a field where you study disease or disaster. A fear of death and a combination of public trust and ignorance seems to keep this organizations doors open. An ethical dilemma that these organizations face is producing research that results in the wide spread use of pharmaceuticals that are injuring and/or killing millions of people worldwide. The legal repercussions for the most part would be the fear of a lawsuit as the result of research passed by a bad drug. An interesting fact to note is a law that was passed 9 years before the creation of the CDC foundation which has determined that “No Vaccine manufacturer, physician, or health facility may be designated a defendant in the proceeding, and there is no determination of legal fault or responsibility for injury”. (The National Vaccine Injury Compensation Program, page 258 para. 1, 1992). Shortly after this law was passed The CDC Foundation came into creation and the American people were left with little recourse if injured by a vaccine. In order for the injured party to get justice they would need to suffer an injury that is already documented with the Vaccine Injury Compensation program. A problem arises when the corruption becomes so out of control that faulty research is provided making vaccine related injuries that are not documented almost impossible to bring the pharmaceutical company to court where they can be held accountable. The For-profit organization to be examined in this report is that of Merck Pharmaceuticals. The area of interest of this company is “As a global healthcare company, Merck believes it has an important role and responsibility in improving access to medicines, vaccines and quality healthcare worldwide, thereby helping to reduce the burden of disease in the parts of the world that need it most.” (Merck 2015). Merck is headquartered in Kenilworth, NJ but has locations based worldwide with a total of 700,000 employees located in over 50 countries. According to the official Merck website “Our product offering categories include heart and respiratory health, infectious diseases and women's health. We continue to focus our research on conditions that affect millions of people around the world - diseases like Alzheimer's, diabetes and cancer - while expanding our strengths in areas like vaccines and biologics.” (Merck 2015). The goal and mission statements involve providing increased access to healthcare globally by contributing to medical research and disease prevention. They are in the trade of pharmaceuticals and vaccines and had a revenue of over 42 billion dollars, and a net profit of 9.4 billion dollars, in 2014 alone. The United States is currently their biggest customer by contributing over 17 billion of the 42 billion dollar gain. Merck pharmaceuticals has built this medicinal empire by providing services to governments and its citizens globally so has a very special interest in the research that is conducted to pass their products for public use as can be highlighted in their official statement that “ Merck is committed to participating constructively in the political process. Government proposals to regulate the health care system may directly affect the Company's business and incentives for pharmaceutical innovation. Also, there are important policy initiatives that can further the company's goals with respect to increasing patient access to medicines and vaccines, and most importantly, to health care insurance coverage. It is appropriate for the Company to help inform the debate on these issues in the United States and in other countries.”(Merck 2015). It is very clear in this statement that the purpose of Merck pharmaceuticals is to manipulate governments, legislation, and policy as a means to gain a profit. Most people assume that this would be done ethically but as most are finding out this is not the case. In a publication by Harvard School of Public health a study was conducted to examine the relationship between Merck Pharmaceuticals and the creation of public policy that results from this relationship. The study was focused on the new vaccine Gardasil being put into use and the authors found that “Merck promoted school-entry mandate legislation by serving as an information resource, lobbying legislators, drafting legislation, mobilizing female legislators and physician organizations, conducting consumer marketing campaigns, and filling gaps in access to the vaccine.” (Mello, Abiola, & Colgrove, 2012). While trying to get their vaccination passed into public use this pharmaceutical company focused its campaign by targeting leaders of healthcare and legislation. The study also found that “Legislators relied heavily on Merck for scientific information. Most stakeholders found lobbying by vaccine manufacturers acceptable in principle, but perceived that Merck had acted too aggressively and non -transparently in this case.” (Mello, Abiola, & Colgrove, 2012). In other words, this company paid policy makers and also provided its own research which may have been faulty as a means for financial gain. The ethical dilemma this company faces is practicing evil deeds under the guise of helping and saving all of humanity. This company is responsible for injury humans globally with research, drugs, and vaccines but is only punished with a slap on the wrist, a fine, and possible public shaming. There are too many laws put into place to protect this corporate giant and as a result of their unethical practices many people are being harmed with little recourse for justice. Further, it has led to the corruption of the CDC and representatives of government as well. After reviewing these facts it seems as if the only crisis this organization will face is if/when it is exposed for its unethical practices and that will not happen until the American government is exposed as well. Currently, there isn’t a systems of checks and balances in place to protect the American public because even their recourse through the court system has been taken away to an extent by the passing of The Vaccine Injury program. A few of the Vaccines produced and marketed by this organization are: BCG (tuberculosis), Comvax, Gardasil, Gardasil9, MMR, Pneumovax 23, Pro Quad (Measles, mumps, rubella, and varicella), Recombivax HB, RotaTeq, VAXTA, Varivax, and Zostavax to name a few. There is a long list of immunizations on the schedule for children and adults and the government passed the Vaccine Injury Program to safeguard pharmaceutical companies from safeguards and sold this idea to the American people by telling them that these companies made very little profit from the vaccines and did not want to scare the companies away from producing them. A profit of over nine billion dollars in one year being deemed as small should probably be reevaluated. Recently there has been a controversy that the MMR vaccine was the cause of Autism. Activists, parents, and a small circle of professionals agreed with this assumption and a doctor named Andrew Wakefield did a study on this link in 1998 which he still defends as truth to this day. The problem with this study is that a majority of the co-authors have come forward to claim that the study was falsified. Two things could have occurred here; either the study was falsified or the Co-authors were paid off by Merck pharmaceuticals to recant their research and Dr. Wakefield is being used as a scapegoat. When most people bring up the MMR/Autism link they are usually mocked and the target of ridicule yet there are still people out there who claim there is an actual link between the vaccine and the devastating disability of Autism. Since this study was debunked other research has surfaced that supports the claim that there is no link and anyone who questions this link is obviously a little wacky. However, a recent court case has sparked interest in this debate once again. In this case, whistleblowers brought a suit against the drug maker not because the MMR vaccine caused Autism but quite the opposite. The Merck whistleblowers claimed that the vaccine didn’t work at all. The most interesting aspect of this case is that the whistleblowers won their case. After an outcome this grand one is left wondering if maybe this court case is actually a ruse perpetrated by the drug company as a means to cover up the MMR/Autism link. By having a case on record stating that the drug was ineffective then it seems impossible for it to even cause harm in the first place, especially a harm like Autism. There are two ethical problems resulting from this situation and the situation involves both Merck Pharmaceuticals and the Centers for Disease control. In a recent story published in Newsweek it is stated that “In the 1980s, the U.S. Centers for Disease Control and Prevention (CDC) launched efforts to curb measles outbreaks by increasing immunization rates, says Dr. Robert Amler, who led the push. The CDC worked with state legislatures to require every child to provide proof of immunization in order to enroll and stay in public or private school, and began to see reductions in measles cases within four or five years. By 2000, indigenous transmission of measles was stamped out in the U.S., according to Dr. Walter Orenstein, chair of the National Vaccine Advisory Committee and former director of the CDC's National Immunization Program. (Ziv 2015). By looking back at the timeline of the passing of the Vaccine Injury Program put into place to protect drug companies and the push for increased immunizations it becomes apparent after reading Merck’s statement on being involved with public policy that something scrupulous has and is taking place. In one unethical allegation the CDC pushed for the MMR vaccination that Merck produces which may cause Autism. On the other hand, the CDC is pushing for MMR vaccination that is produced by Merck and the vaccinations are ineffective. In both instances the CDC and Merck have made Dr. Wakefield their scapegoat. The CDC and Merck pharmaceuticals may have created the illusion that Dr. Wakefield is a fraud and then placed the blame of the new measles outbreak on his shoulders by pushing parents not to vaccinate. The end result is that no sane citizen will ever again question the MMR/Autism link for fear of being ridiculed. Further, the Center for Disease Prevention and Merck pharmaceuticals will not have to face the consequences of producing, selling, and forcing a placebo vaccination because the blame can be placed on the shoulders of parents who refuse to vaccinate their children. What is interesting about this whole scenario is what Dr. Wakefield himself has to say about the study that lead to ostracism when “He points out that his now infamous study never asserted a causal relationship between the MMR vaccine and autism. “We merely reported the parent’s description of what happened to their children, and the clinical findings,” he says. “We made no claims about the vaccine causing autism. In fact, we said this does not prove an association. And all we urged was further research.” The authors of the paper wrote at the time, “We did not prove an association between measles, mumps, and rubella vaccine and the syndrome described. "(Ziv 2015). This is a very interesting statement because of the fact that he was calling on the scientific community to conduct further research on the MMR/Autism link and not only was he shut up but anyone else who would dare do research on the topic would most likely never bring their findings if negative into the light of day. The CDC and Merck pharmaceuticals not only acted unethically, they did so together. Moreover, these two organizations scratched each other’s backs all the way to the bank and The CDC Foundation was the convenient troy horse which was built as a way for Merck to slither its way through the back door of the White House and nobody suspects a thing. Merck pharmaceuticals is responsible for creating this moral dilemma through unethical business practices while the Centers for Disease control and The CDC Foundation were hopefully involved in the situation because of the outside force. Merck pharmaceuticals and the CDC Foundation are both responsible for this problem. The only way this situation could have been prevented is to leave business out of the creation of research and medicine. The theory of deontology was used by these organizations because this theory focuses on the action being right or wrong instead of the consequence of the action. The action of producing vaccinations in order to prevent illness or death conforms to what most consider a moral norm. However, the consequences of those actions are wrong. Laws were passed to protect vaccine manufacturers and as a result the public may have suffered the consequences. Moreover, moral relativism is also called into practice and utilized because while the vaccine manufacturers maybe lying about the effectiveness or damage caused by a bad vaccine in this case it seems as if lying to the public may be the right thing to do. If this lie were to be exposed then many parents would never vaccinate their children at all which could cause harm because some vaccinations are effective in preventing illness with no serious side effects. In this case, each citizen has a duty to become vaccinated based on their obligation to the public at large to remain free of preventable illness. It is then up to the moral relativist to decide if the consequences of this unethical practice are right or wrong. These companies should have used the virtue theory when manufacturing vaccinations, passing laws making them mandatory, and while conducting research to their safety. If this were the theory that were incorporated then it would not matter if the consequences were good or bad. The only thing that would matter is if these decisions were made with the best interest of society in mind. There is a very obvious relationship between profit and suffering in this case. Through human suffering created by disease and illness a business is making a sickening profit in the name of man- kind. These organizations are inducing fear into the public through mass marketing of their product and the product may not even work or could kill a person. The awful truth is that any research done on these practices or the vaccinations themselves may not even be truthful or fact. The meaning of running an ethical business involves making decisions based on the assumption that one should do no harm. A business should decide if they are creating harm and to what degree of harm is the result of their business practices or products. The best way for a company to maintain its competitive edge and to contribute to overall good or happiness for the majority would be to practice honesty and transparency. Once a company is known as being dishonest all of their practices, products, and associates then become scrutinized as well. In theory these organizations have adopted Virtue ethics as a statement of practice but it literally practices the opposite. This type of schizophrenic practice of business ethics have put people around the globe in harm’s way. For these reasons the relationship between these organizations is unethical and should be banned because it has put the public at risk and their best interest violated.